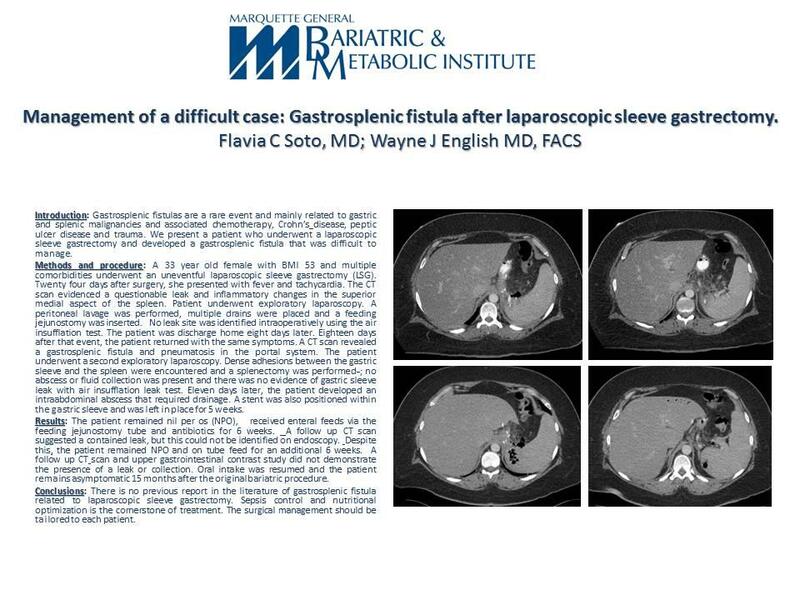 Management of a Difficult: Gastrosplenic Fistula After Laparoscopic Sleeve Gastrectomy. Introduction: Gastrosplenic fistulas are a rare event and mainly related to gastric and splenic malignancies and associated chemotherapy, Crohn’s disease, peptic ulcer disease and trauma. We present a patient who underwent a laparoscopic sleeve gastrectomy and developed a gastrosplenic fistula that was difficult to manage. Methods and procedure: A 33 year old female with BMI 53 and multiple comorbidities underwent an uneventful laparoscopic sleeve gastrectomy (LSG). Twenty four days after surgery, she presented with fever and tachycardia. The CT scan evidenced a questionable leak and inflammatory changes in the superior medial aspect of the spleen. Patient underwent exploratory laparoscopy. A peritoneal lavage was performed, multiple drains were placed and a feeding jejunostomy was inserted. No leak site was identified intraoperatively using the air insufflation test. The patient was discharge home eight days later. Eighteen days after that event, the patient returned with the same symptoms. A CT scan revealed a gastrosplenic fistula and pneumatosis in the portal system. The patient underwent a second exploratory laparoscopy. Dense adhesions between the gastric sleeve and the spleen were encountered and a splenectomy was performed; no abscess or fluid collection was present and there was no evidence of gastric sleeve leak with air insufflation leak test. Eleven days later, the patient developed an intraabdominal abscess that required drainage. A stent was also positioned within the gastric sleeve and was left in place for 5 weeks. Results: The patient remained nil per os (NPO), received enteral feeds via the feeding jejunostomy tube and antibiotics for 6 weeks. A follow up CT scan suggested a contained leak, but this could not be identified on endoscopy. Despite this, the patient remained NPO and on tube feed for an additional 6 weeks. A follow up CT scan and upper gastrointestinal contrast study did not demonstrate the presence of a leak or collection. Oral intake was resumed and the patient remains asymptomatic 15 months after the original bariatric procedure. Conclusions: There is no previous report in the literature of gastrosplenic fistula related to laparoscopic sleeve gastrectomy. Sepsis control and nutritional optimization are the cornerstone of treatment. The surgical management should be tailored to each patient.